GoPens.com | Welcome To The Gopens.com Blog! Welcome to the gopens.comn blog! 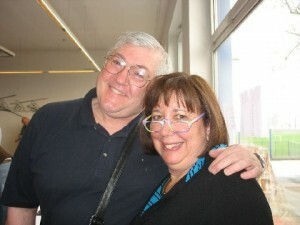 Hi, this is Gary and Myrna Lehrer, operators of gopens.com and publishers of the Quarterly Illustrated Vintage Pen Catalog. We’ve wanted to start a blog for several years now so we can share lots of pen related information which we just can’t fit into our Catalog, and for which there is no other place on our website. We’ve just never had the time to do it. But now we are resolved to make the time, partially because of meeting Azizah Asgarali who has come on board to work with us. She’s very experienced with blogs and will help Myrna and I with our writing, as well as writing entries herself. Her energy and enthusiasm is contagious, and we’re exciting about getting started. So if you love pens (especially vintage pens) this will be the place for you, and we encourage your input and feedback! To start, I thought I would share a photo of us when we toured the Monthlanc factory in Hamburg. 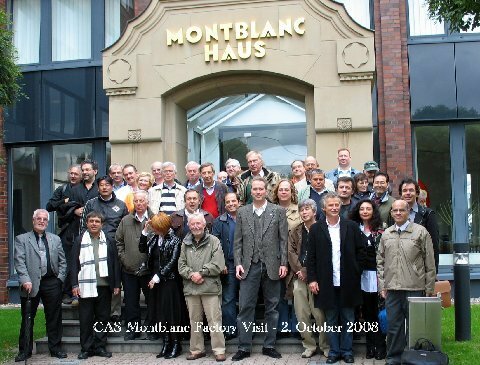 You may know that we are very likely the largest dealers of vintage German pens in North America, including Montblanc, Pelikan and Soennecken. Keep an eye on our Catalogs (and visit the archived Catalogs as well). Great idea to start a blog !! “Meisterstuck” would have been for the German market while “Masterpiece” for the English speaking market.